“Why?” I’m sure that a teacher heard that question yesterday, as debris rained down, and had no answer. “Why?” I’m sure a parent heard that question yesterday, when siblings were not found alive, and had no answer. “Why?” I’m sure more than one adult asked that question yesterday, about so many things, and received no answer. “Why?” I asked it today, and God sent me a verse. In my Bible study, our passage for day was the story in John 5 of the man who was healed at the pool. Verse 14 disturbed me. And I don’t want it to be God’s answer. But maybe it is. “…Stop sinning or something worse may happen to you.” But WHY? Why the children? Why those who are faithful? Why? I don’t know that answer. I never will. But I DO have other answers. Forever God is faithful. Forever God is with us. We are not alone. He will be our hope. He will be our help. He will be where our strength comes from in this time. When Jesus came, he left the Holy Spirit behind to provide us with perfect peace. Even in times of trouble, we should not be afraid. For He is always with us. God ALWAYS loves us. His love will never fail, even when everything else around us does. We will move on by placing our hope and trust in the Lord. We will move on. The city will be rebuilt. The schools will be rebuilt. The houses will be rebuilt. Lives will be made new. Our God is a God we can pray to. Our God is a God of action. And in the ancient days, He proved Himself in battle time and time again. He will prove Himself again in this battle against fear, desperation, and hopelessness. He will prove Himself again against the disaster that has occurred. He came to help the powerless against the mighty, and He will again. We are God’s inquisitive children. We will never understand His reasoning. Many will question. Few will hate. Few will run. Most, I pray, will find their strength renewed and will soar on wings like eagles. I have friends whose family members are missing. Friends whose homes have been destroyed. Friends whose places of business are gone. But I choose to rejoice. All of the people I know are alive. Our hearts are broken, but if we choose to let Him, God holds the glue – the glue to repair our lives. The glue to bond us together and to Himself. That glue doesn’t answer the question of “Why” it happened, and those answers we may never know. But it does answer so many others. For that, we are thankful. For that, I praise Him. Good will come from this. Yes, heartbreak and tragedy and more and more and more stories of defeat and pain will come from this, but so will Good. 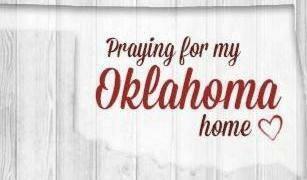 Prayers from this heart in San Antonio, Texas, who will always be an “Okie” inside.